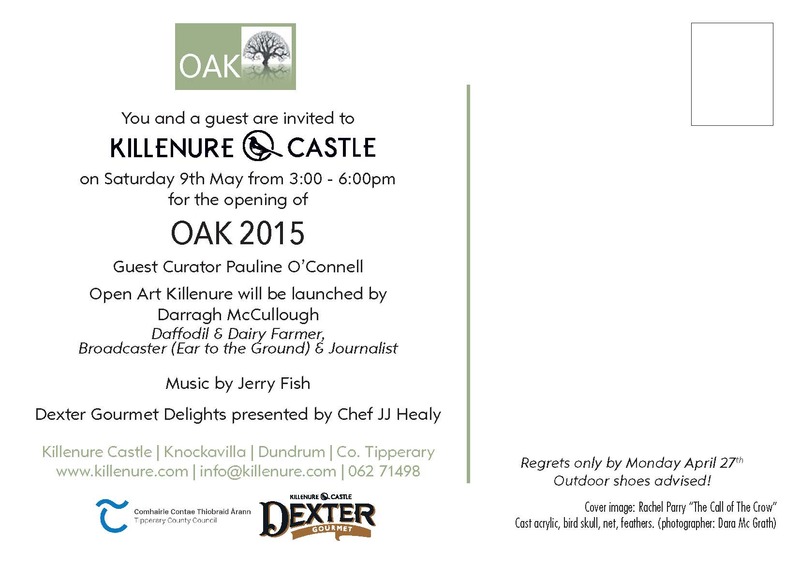 Opening of “OAK 2015” at Killenure Castle, Dundrum (near Cashel) is on Saturday 9th May from 3.00 – 6.00pm. Curated by Pauline O’Connell and to be opened by Darragh McCullough. Music bu Jerry Fish. 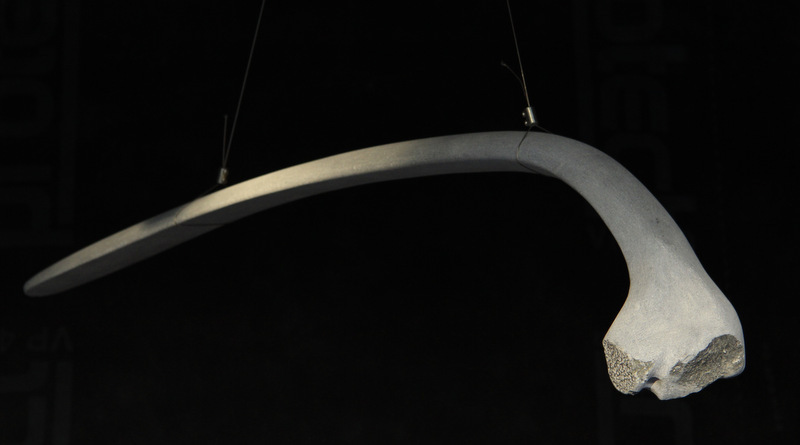 I am going to install my Rib Bone (wing) and a Sycamore Seed (wing) sculpture on Monday for the show. This years exhibition will be officially launched by Darragh McCullough (farmer, broadcaster, journalist, presenter on Ear to the Ground) on Saturday 9th May 2015 from 3 – 6 pm. There will be food and live music at the opening and hopefully some sunny weather! Please feel free to camp in the back field if you so wish, alternatively there is plenty of accommodation nearby in Dundrum and in Cashel. The area around Killenure, just six miles from the Rock of Cashel, was at the heart of the powerful O’Dwyer lands. The clan erected this large tower house castle here in the late 16th century. The castle, with its unusual round corner towers (one tower is still fully operational with three habitable rooms), is believed to have been burnt by Cromwell’s forces in the mid 1600s. Read more about the O’ Dwyer’s. Passing into the hands of the Cooper family, who lived here for six generations from 1746 until the 1960s, the house underwent major alteration and extension in the 1800s. The shell of the fortified house still stands today, and is shown in the late 18th century painting by well-known antiquary Austin Cooper, beside a single-storey over-basement country house. Cooper spent his childhood at Killenure, so his drawing should be considered reasonably accurate. The original thatched 17th century house was enlarged and extended to link the house to the well-preserved castle ruins. The Cooper family lived there for 217 years, 6 generations. After the Coopers sold the property in 1963 to the Alisons, they in turn sold it to the Baileys and some of the outbuildings were turned into a school. In the mid 80s Jessica Roth became the owner and developed an art studio and meditation centre. In October 2007 the present owners (Eavaun Carmody and Emmet Sexton) bought the property and have begun extensive work on the house and the grounds. They hope to restore the walled garden in 2015. With a background in art and design and passion for period property, they have restored and sensitively modernised this home for their own family. They are developing Killenure Castle™ as a cultural destination during the summer months. At other times of the year, the property can be hired for cultural events. “This year’s exhibition aims to reawaken a ‘ghost’ of times past. My curatorial thinking relates to ‘time’, the history / the lives (both human and animal) the domestic activities, the utilitarian aspects of the working farm from the past embedded in the historic ruins of the castle and in the surrounding farm buildings. Whilst the fabric of the stables, tack rooms, hay lofts / gallery spaces are in tact and have not been affected by any embellishments, there remains a presence in the vacant spaces, an echo of what was once there. So, it is this ‘ghost’ that I am interested in, a reawakening through artistic interventions and installations. A cross section of art practice accounts for the wide variety of work on display, ranging from traditional sculpture, painting to video and installation, work that relates to the rural context in varying conceptual and textural ways.”The list of artists are : Michael Canning, Maud Cotter, Eileen MacDonagh, Daphne Wright, Marie Foley, Sonja Landweer, Margaret Tuffy, Cecilia Bullo, Cecilia Moore, Bob Frazier, Martin Lyttle, Martha Quinn, Tom Fitzgerald, David Fitzjohn ( Wales ), Michael Fortune, Rachel Parry, Aoife Banville, Eva Kelly, Holger Lang (Austria).